The Russian National Committee for BRICS Studies will draft a new strategy for emerging world powers. Out of all Russian foreign policy think tanks that focus on a variety of international issues, there is one that deals with a single but very acute topic. The National Committee on BRICS Studies was founded in 2011 and has since then been dealing exclusively with the Brazil, Russia, India, China and South Africa economic and political alliance. Dubbed by Goldman Sachs global analyst Jim O'Neill as BRIC in 2001 (after the enlargement in February of 2011, the letter “S,” which stands for South Africa, was added to the acronym), this international association of major and emerging world powers has not only held five high-level summits, but has also evolved into a significant global player that promotes a multi-polar world. Given the fact that the first summit of the BRIC countries took place just five years ago, in 2008 in Yekaterinburg, the dynamic development that the organization shows, the global economic downturn notwithstanding, is nothing short of impressive. Headed by Vyacheslav Nikonov, who is the chairman of the State Duma Committee on Education and the head of the management board of the Russkiy Mir Foundation, the National Committee for BRICS Studies has by now established itself as a well-known organization conducting research and analysis. “The committee functions as an umbrella structure. We organize, finance and coordinate studies with regard to the role of the BRICS countries in the global economy and on the political arena. What we’re doing could be described as ‘track two’ diplomacy to strengthen and promote this organization,” said the committee’s Executive Director Georgy Toloraya. According to Toloraya, a former high-ranking diplomat and a well-known international affairs scholar, a BRICS Think Tanks Council was set up during the last BRICS summit in Durban in March of 2013, and Russia’s leading research organization on BRICS is currently in the process of drafting a long-term strategy for Moscow, Beijing, Brasilia, New Delhi and Pretoria. “This is one of our major ongoing projects. Along with our colleagues from other countries, we’re trying to lay out a common vision of the BRICS’ future and its grand strategy. Discussions among experts allow us to get a more informal sense of our partners’ views of the alliance’s future,” Toloraya said, adding that the final version of the draft strategy will be discussed this fall in Cape Town. If a consensus is reached among the expert and scholar communities in this South African city, the white paper will be up for approval by the BRICS countries’ leaders during the next summit in Brazil in 2014. 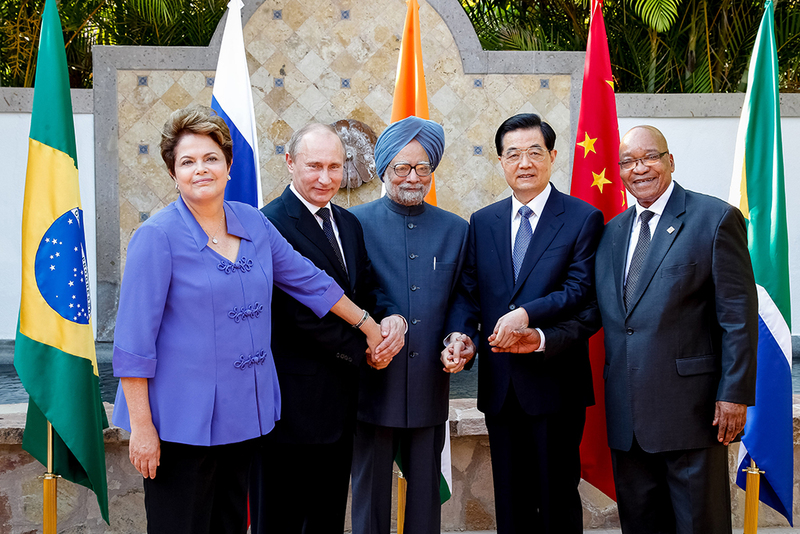 “BRICS is a political project and its development relies heavily on new ideas. Both practitioners and experts have to be very creative in order to breathe new life and set up new projects in this organization. That’s why the committee is trying to concentrate intellectual resources to achieve this goal. In particular, we are looking for young and promising experts who will become ‘Bricsologists’ one day. After all, given a smart policy and the right circumstances, the BRICS phenomena is going to last for a very long time,” Toloraya said. Not surprisingly, the National Committee for BRICS Studies is expecting foreign specialists to be engaged in this work along with Russian scholars. Apart from organizing and taking part in conferences and roundtables, the committee also publishes reports on various aspects of BRICS’ political and economic dimensions. Finally, to say that Moscow pays a lot of attention to BRICS countries – an alliance that comprises 30 percent of the global landmass and 45 percent of the world’s population – would be oversimplifying Russia’s approach to this “global political club.” In fact, the latest version of Russia’s official foreign affairs concept mentions BRICS numerous times, and puts it on an equal footing with the G8, the G20 and the Shanghai Cooperation Organization. A multi-vector foreign policy, which the Kremlin is aggressively pursuing nowadays, has actually been the cornerstone of Russia’s international policy since the late 1990s. The so-called “network diplomacy” represents another example of Russia’s preferred way to deal with foreign issues in a globalized world. The robust format of the BRICS fits perfectly into this paradigm.